Wow. Not sure where to start. I’ve just completed the first week of my Vodder training – the basic level. While what I have been using for years was based on the Vodder technique and the sequences and ideas are similar, the touch is very different. I thought what I had been doing was a very light touch, but I think I’ll dream the words “lighten up” for a very long time to come. Along with “make sure your little finger is on the body”. These two phrases were the most often repeated all week. By Wednesday I think we were all shell-shocked and wondering what we were thinking enrolling on the course. By today though, we were all feeling more confident that we at least understood what we were doing wrong! Sigh. We were a mixed bag – seven students in all. 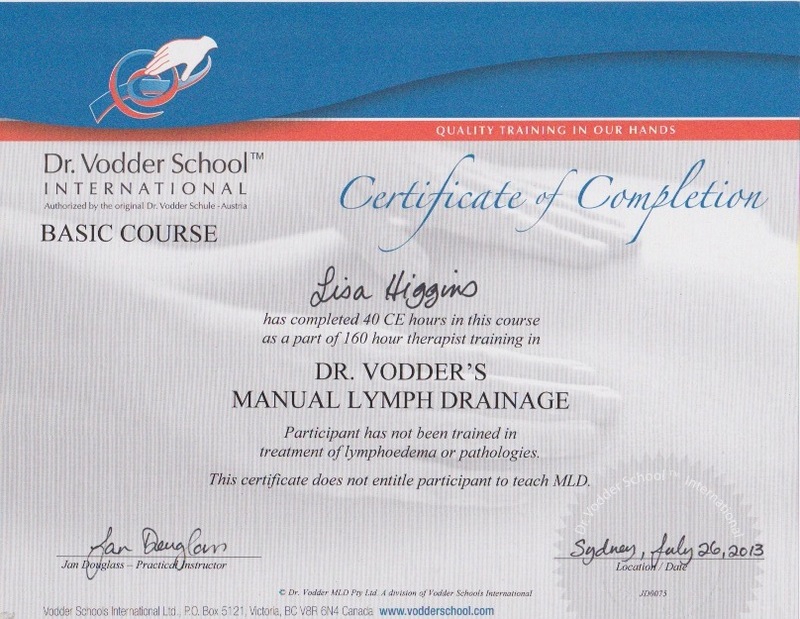 There was one other lady who had experience giving lymphatic drainage, she was only doing the basic course but I’m sure she’ll be back another time to add to her knowledge. None of the other ladies had any previous experience giving lymphatic drainage but most had experienced a treatment themselves. All the women were massage therapists. And we had one gentleman from Korea who is a physiotherapist. I have a lot of studying to get through this weekend and of course I’ll be trying some of my new techniques on my clients tomorrow. But I think I’m looking forward to being able to sleep in on Sunday more than anything else right now – my alarm goes off at 5 am every morning and I walk through the door at about 7pm each night. Long days indeed. One week down, three to go. So much to learn, so many inspiring people to meet and learn from. This is a blog from one of my clients – she has learnt so much along the way and gathered a fantastic team of therapists to help her find her strength back. Hers is the most empowered journey I’ve come across so far. Onwards and upwards! What about lymphoedema? There are so many opinions about what causes this, who will get it, what you need to watch out for, how you can ensure you don’t get it. I had my sentinel (lymph) nodes (in the chest wall) removed and then in a separate operation, where 18 lymph nodes were removed. This was the most painful part of the surgical procedure – 5 days in hospital, 15 days with a drain and months of pain, discomfort and tingling nerves. 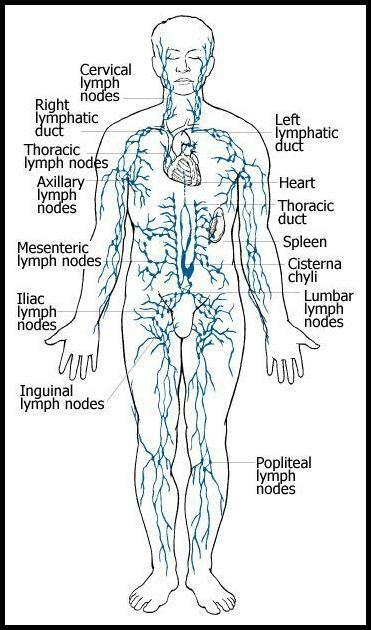 Fortunately the nodes were cancer free. I didn’t even think about lymphoedema, especially because I was slim, until my surgeon said to me, “it would be good if you went to see Teresa Lee”, a lymphatic physiotherapist. I couldn’t get into see her, but I did see her colleague, Carol Morris. I just had to write about this result. E is the lovely lady who tried to organise the grant from Bendigo Bank for me to purchase my laser. She’s been a regular for over three years now, coming monthly to keep her lymphoedema under control and she’s had intensive treatment at Mt Wilga Hospital. She wears her sleeve daily and bandages herself when she feels the need. She also exercises regularly. Lymphoedema is part of her daily life. E came in to see me last week to try out the new laser. She’s had laser before at Mt Wilga and found it very benefical. She was surprised to see the size of my LTU-940, it is a hand held device and so quite small and very portable and the one at Mt Wilga is a pretty big machine. She’s been having some physio for the last few months, as she has some inflamed tendons in her shoulder but she had not had much relief and last week her physio suggested she get a cortisone shot. She hasn’t been able to wipe down the kitchen benches or iron or even get into the pool for her aquaerobics. She had a call into her GP to discuss it, because she wasn’t too keen on the idea. 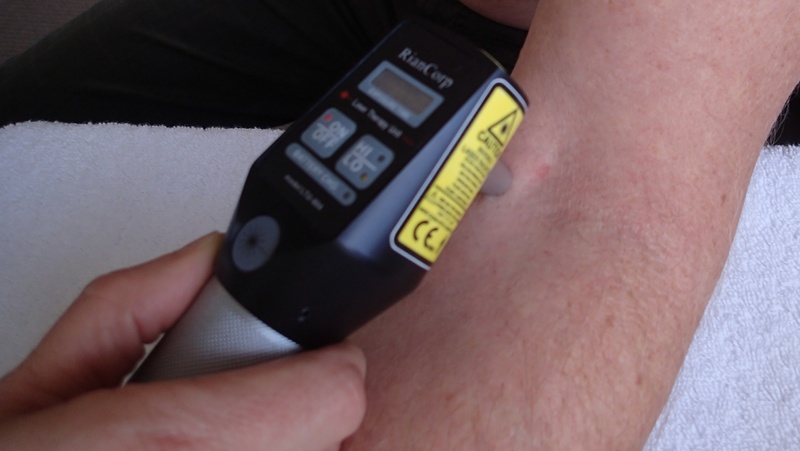 What I felt is that the laser would help both on a lymph and a muscular level – it was certainly worth a try. She also had some sciatic issues on the opposite side to the arm, so sleeping was impossible as she couldn’t lay on the left because of the sciatica and couldn’t lay on the right because of the arm, so all in all, a very frustrated camper. So, I laid her on the table and I started working from the top of her arm, three points in a row then coming 2cms down and working another three points in a row and so on down the upper arm. By the time I got to her elbow she said the pain was almost gone! At that stage I was able to raise her arm to work in the axilla and down the inside of her upper arm, then down the forearm (her tightest area is down the front of the forearm into the wrist). We did 30 minutes of laser and one hour of manual lymphatic drainage. At the end of the sesssion she had no pain! She was in shock (so was I if I’m honest, didn’t expect such a big result). Hi Lisa, thank you so very much. I had the best night’s sleep. I tossed and turned a couple of times that I knew of but no where near the pain that I have had the last few weks. Woke up at 9.40am and only because the phone rang. Still feel the problem but so much better with no pain. So a big thank you. May need another next week for sanity. I spoke with her this morning, four days after treatment and she’s still feeling much better. Still not able to do her housework, but pain levels are way down. She’s booked in for a follow up later this week.